Gerkan, Marg and Partners (gmp) is a prominent name in the field of architecture. The company traces its origin in Hamburg, Germany and was founded in 1965 by Meinhard von Gerkan and Volkwin Marg. It has since branched out internationally. Today, the company employs more than 500 staff in eleven offices spanning Germany, China, Brazil, Russia and Qatar. gmp has a global footprint today in the form of over 300 buildings constructed by the company worldwide. These would include museums, theatres and concert halls, office buildings, commercial centres and hospitals as well as research facilities, buildings for transportation, master plans, trade and industry buildings, educational and sports facilities. With over 20 built stadia, including different stadia for FIFA WC’s worldwide, gmp has established itself firmly as the world leader in the field of designing stadia and completed sport facilities while meeting the FIFA guidelines. gmp won the project in 2011 through a competition. gmp’s design received the first prize. The stadium is designed for the Russian first league player FC Krasnodar. At the moment the building for 36,000 spectators is under construction. The stadium outline is oval-shaped. The façade cladding made of large format natural stone panels. The bowl’ façade, by contrast, is made of modern materials. The roof structure is a light-weight cable construction with membrane coating which is not visible from outside. The project came to gmp as a direct commission in 2013. Once completed, the stadium will become a unique landmark in the neighbourhood of the historical Motherland Monument of Volgograd. The design includes a woven stadium façade reflecting the Russian art of weaving. Multiple layers of structure create a systematised complexity in the perfect hyperboloid building shape. The stadium will have a circular shape to allow a perfect integration into the proposed masterplan with its urban structure and its central axis. The north-west orientation of the stadium corresponds to FIFA and UEFA regulations. 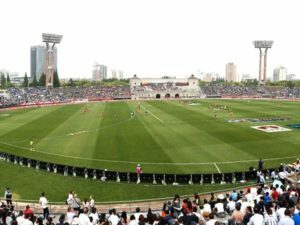 The compact geometry of the stadium bowl has been designed to provide perfect viewing conditions for its 45,000 spectators and to minimise construction costs, by using a linear tier geometry parallel to the pitch. The new World Cup Stadium in Nizhny Novgorod, with a capacity of 45,000 seats, is located at the confluence of the rivers Oka and Volga. The stadium design is based on the combination of structural order and dynamic elements. The stadium will be divided into upper and lower tier. A striking aspect is the maximised amount of seats along the central axes. On those positions spectators get excellent view on the pitch. Less-comfort-seats within the corners are minimised. 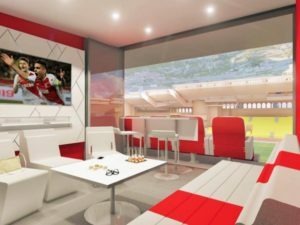 The lower tier and the VIP seats have been designed with an aim to offer maximum comfort sightlines. An exclusive loge house, accommodating a Hospitality Club and two VIP floors with skyboxes, is inserted in the grandstand. gmp’s design is inspired by the local aircraft, rocket and metal industries and the motion of flying. This is evident in the dynamic shape of the stadium which represents a ‘space object’ and is highly visible and exceptional in the urban silhouette. The 45,000-seater stadium will be located in the heart of a picturesque landscape and cottage settlements. It will benefit from attachment to the existing highways. In the North-South axis of the stadium a new television tower is envisaged. Stadium and tower become unique landmarks for Samara and form local attraction for tourism, entertainment and sport events. The existing stadium built in the 50s is situated in the centre of the Belarusian capital and will be converted into a modern, multifunctional football stadium with a capacity of 41,000 seats, preserving the historic facade of the stock. The design provides new tier geometry and complements the building with a characteristic roof. The roof structure is a new facade and visible from afar. Their translucent surface will double-up as media screen. 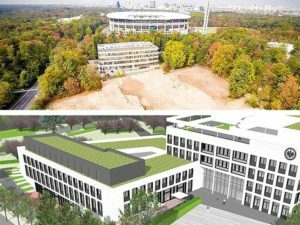 With the creative synthesis of the existing and new building, the National Stadium will be a characteristic landmark in the heart of the city of Minsk. For the Summer Olympic Games 2016 in Rio de Janeiro, gmp is designing the Aquatic Centre as well as the Tennis Centre in the district of Barra da Tijuca in cooperation with sbp, Lumens Engenharia and Sustentech. The Tennis Centre with a capacity of 10,000 seats is designed as a permanent building, whereas the Aquatic Centre serving 18,000 spectators is designed as a temporary building. 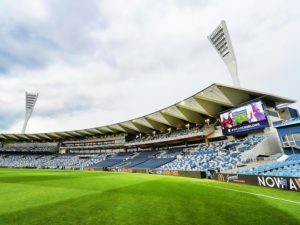 The complete project covers two additional, temporary Tennis Centres with a capacity of 5,000 and 3,000 seats, seven Tennis Courts, each 250 seats, six Training Courts as well as the Warm-up Pool for the Aquatic Centre. The gmp’s design is focused on comfortable and secure access for spectators and athletes with restricted mobility, with the main focus on the Para Olympic Games 2016.